One of the nice things about being outdoors in mid-autumn and onward into winter is the lack of insects one has to endure. No ‘skeeters, ticks, no-see-ums, deer flies or other biters. Except, of course, during the last decade or so, outdoorsmen would be swamped by "imported lady bugs" during Indian Summer. You can recognize these Asian lady bugs by the M-shaped mark on their neck -- and the bite marks on yours! These aren’t mild-mannered, cute and cuddly native lady bugs. 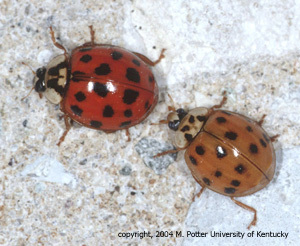 These are swarms of Harmonia axyridis or Asian lady beetles that look very similar to our domestic version of lady bug. Soybeans were imported to the US long ago from Asia and have become one of the most important agricultural crops. Asian lady beetles were imported to the US by home gardeners who would release them as a biological control for aphids in their roses. I don’t know if that worked, but about 15 years ago the soybean aphid showed up in America and the result has been plagues of lady beetles approaching biblical proportions. There are millions of acres of Asian soybeans, harboring gazillions of Asian aphids, being feasted on by bajillions of Asian lady bugs. It's a transplanted Asian ecosystem here in North America. And once the soybeans are harvested, the bajillions of lady beetles, deprived of their main source of food, look to other sources, such as coyote trappers bent over setting a trap in the corner of a soybean field. Yep, those suckers bite. The back of my neck is their favorite spot. And when you swat them, the reward is a foul stench worse than the smells coming from the back of my trapping truck! I’m happy to report the supply of ALBs this year was piddling compared to most. I’m enjoying the respite but I understand how nature cycles populations. Wait for next year. You are mostly right about the insects, but not completely. I pulled a small tick off my ear Tuesday night. I had been deer hunting from the ground on Saturday. I don't know if it was a deer tick or a juvinile wood tick.